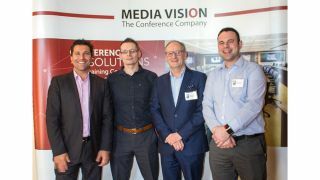 Media Vision, a leading provider of conference systems and professional audio solutions, has partnered with Medium UK Ltd, an established audio visual distributor, to supply the line of TAIDEN conference microphones and interpretation systems to the UK market. Media Vision’s track record in the UK includes its global unified custom design for MFS Investment Management, including their London facility, and supplying E Ink electronic nameplates for global think tank International Institute for Strategic Study (IISS). Medium—a business to business distributor of interactive and large-format displays, projection, digital signage, and connectivity solutions—was recently acquired by Exertis, a distributor of technology products in B2B, mobile, and retail markets. This acquisition places Medium UK in a valuable position where it can now service a sector beyond the traditional AV market. The TAIDEN G3 Paperless Multimedia conference system is an example of the all-in-one solutions that will best meet the needs of Media Vision and Medium’s expanded customer base. Media Vision will support Medium UK at the technology event Plug-In to Exertis on May 11, 2017, which will be held in Twickenham. The event will host industry experts, covering keynote topics in various seminars. Over 80 of Exertis’s leading vendors will showcase their products and solutions.